In one moment, Batgirl irrevocably tore her family apart. Faced with no other choice, Barbara Gordon was forced to kill her brother, James Gordon Jr., a madman and a murderer. With James dead and their mother is leaving town, their father-Gotham Police Commissioner Gordon--is on a mission to arrest the person responsible for his son’s death: his own daughter! As the Commissioner unknowingly mounts this manhunt, can Batgirl protect her secret and keep herself out of jail? 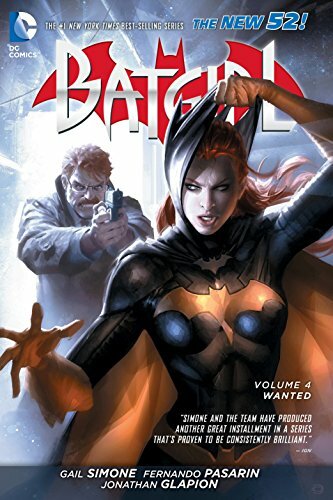 Batgirl scribe Gail Simone (SECRET SIX) and gifted artists Fernando Pasarin (GREEN LANTERN CORPS) and Daniel Sampere (TRINITY OF SIN: PANDORA) take Batgirl and Commissioner Gordon down their darkest road yet in BATGIRL: WANTED. Collects BATGIRL #20-26 and BATMAN: THE DARK KNIGHT #23.1 - VENTRILOQUIST.